Private 10470 David Charles Pearce, 8th Battalion, Royal Berkshire Regiment. David was born in late 1887, the son of David Charles Pearce and his wife Elizabeth Sarah née Carr. David was their eldest son, the second of nine children who were raised in a small cottage in Pembroke Road, Newbury (now demolished). David senior was a labourer working for a local builder, eventually developing his skills and becoming a plasterer. David junior followed his father into the building trade, first as a painter’s apprentice and later as a general labourer. When war broke out he was quick to sign up, his service number suggests that he enlisted in September 1914. At about the same time the Royal Berkshire Regiment formed a fourth new battalion to supplement their four peacetime battalions – the 8th (Service) Battalion. David must have been one of the first to be allocated to this new unit, which started its life at the Codford Training Centre before moving into billets at Reading in November 1914. In May 1915 they moved to Sutton Veny near Warminster, Wiltshire, where they completed their training in preparation for their move to France on 7 August 1915. In France they joined the veteran units of the 1st Division and fought with them through the great battles of Loos, the Somme and Passchendaele. In February 1918 a reorganisation of the army saw the 8th Battalion transferred to the 53rd Brigade in the 18th Division where they replaced the recently disbanded 6th Battalion, Royal Berkshire Regiment. David served throughout this period; he would probably have had a few chances for a short trip home on leave and it is very likely that he spent some time away from the front after receiving minor wounds, but, in 1918, he was one of an increasingly small number of survivors from the battalion that crossed the Channel in 1915. In March 1918 the Division was holding a section of the line south-east of St Quentin, towards the southern flank of the British forces, the line to the south being held by the French army. At 4.40am on 21 March the Germans struck at the British line in overwhelming force, the battalion lost over half its strength, many being forced to surrender as they found themselves surrounded by the enemy in far superior numbers. By 10am the remnants of the 8th Royal Berks had fought their way through the encirclement and were engaged alongside the remnants of the 10th Essex in a desperate defence of the rearward defensive positions. Over the ensuing days these two battalions were combined with a French trench mortar battery into a ‘composite’ battalion, although between them they could barely raise two companies. Mr and Mrs Pearce, of Falkland-place, Newbury, have been notified of the death of their eldest son, Private D C Pearce, 8th Royal Berks. He was taken prisoner in March, and died on May 20th. There were four sons in the service, one in Ireland, another in France, the third discharged, and the fourth now reported dead. David's name on Newbury War Memorial. He is buried in grave VI.B.7. in Grand Seraucourt British Cemetery. 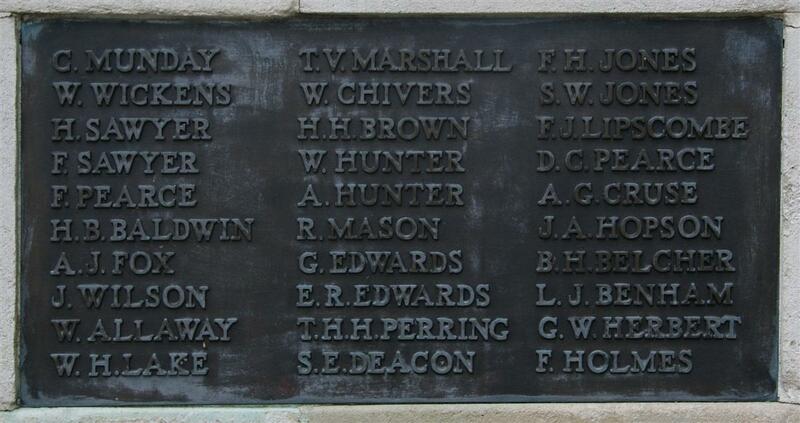 Locally he is remembered on Tablet 3 of the Newbury Town War Memorial. Francis Frederick, born in 1892 and known as Frank, signed up on 16 June 1911 as a Territorial in the 4th Battalion of the Royal Berkshires (No 1596). He would have attended regular drill nights as well as the annual camps. In 1914 the Territorials arrived at their annual camp on 4 August – only to be turned round and sent home as news of the declaration of war reached the regiment. The following day they were mobilised and were sent off to home defence duties. They were soon asked to volunteer for duty overseas (the Territorials were signed up for home defence only). Some 70% of them volunteered and formed the core of the 1st/4th Battalion while those who opted to remain on home defence, and those otherwise deemed unsuitable for duty at the front, formed the core of the 2nd/4th Battalion. In January 1915 Frank was with the 2nd/4th in Maidenhead, however, his allocation to this battalion may well have been to do with his fitness rather than a reluctance to serve in France. On 8 January 1915 he was discharged from the army as ‘medically unfit for further service’. William Thomas, born in 1894, was another pre-war Territorial who seems to have been impressed by his elder brother’s decision to join up and signed up himself only 12 days later, on 28 June 1911, being given the regimental number of 1602 – only 6 above that of Frank. His attestation papers show that he was working as a labourer for Elliot’s the furniture makers in Albert Road. He was 17½ years old and 5ft 5in tall. Along with Frank he was mobilised on 5 August 1914, however, his service was even shorter than his brothers being discharged on 25 September 1914 ‘having been found medically unfit’. Whatever ailments caused their discharge did not prevent them from living full lives, Frank died in 1960, aged 68 and William in 1967, aged 73. It has not been possible to find details of the service of the remaining brothers, Robert Edward (born 1893) and John Edward (born 1895), though they are, presumably, the two brothers reported in the newspaper as serving in Ireland and France. Both survived the war Robert dying in 1978 aged 84 and John in 1976, aged 81. David’s sister, Daisy Harriet, married Alfred William Dean who served with the Royal Engineers (Driver 103240) and died in Reading in March 1919. Alfred is remembered on Caversham War Memorial , on the bank of the Thames. He was buried in the Hemdean Road Cemetery in Caversham where his final resting place is marked by a Commonwealth War Graves Commission headstone.